Modern yet cozy, this two-story, eco-friendly retreat by Selin + Selin Architecture reinterprets multigenerational living. Surrounded by forests and sitting on the banks of the New Haven River, Lincoln, Vermont, is a scenic town not far from the popular ski resort Sugarbush. Kim Smith raised his family here, in a circa-1835 farmhouse—a home that his son Oakley now resides in with children of his own. 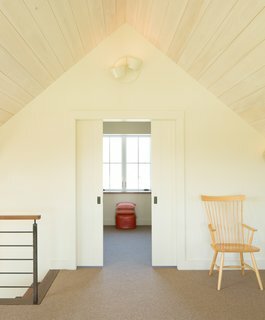 Drawn back to this rural land that the Smiths have owned for more than 40 years, Kim turned to Oakley, founder of the construction firm Smith & McClain, and Shelburne–based Selin + Selin Architecture to create a small, energy-efficient abode that would peacefully co-exist with the 19th-century structure. The new addition is in perfect harmony with the barn erected over 30 years ago. 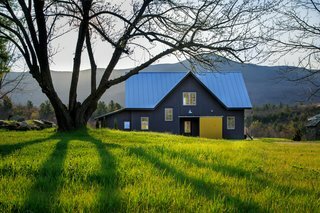 Incorporating a 12-inch-thick double stud exterior wall, the contemporary farmhouse is a prime example of green construction, down to the air-to-water heat pump boiler. 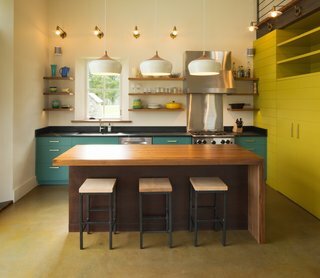 Doubling as a workshop, a barn that Kim built in the 1980s separates the original farmhouse from his new 1,800-square-foot, bi-level one. 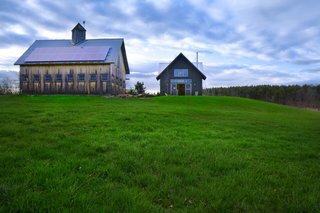 "We made a composition of this building in relation to that barn," says Stephen Selin, who leads Selin + Selin with his wife Judith. 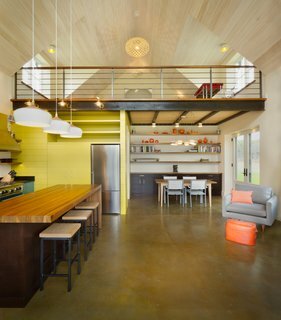 Given its central location, the barn organically imbues a sense of privacy between the two homes. 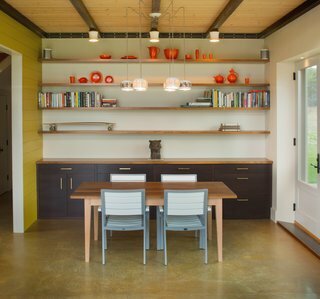 The Smith family desired an open kitchen, reinforced by shelving and minimal amounts of locally made cabinetry. 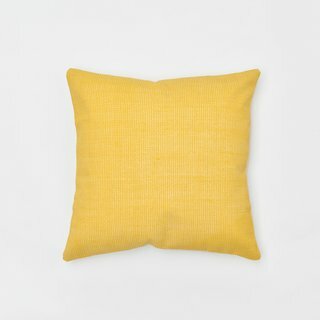 Make it pop with our cotton accent pillow covers. Designed to provide the finishing touch to pull your bedroom look together and make your bed even cozier. 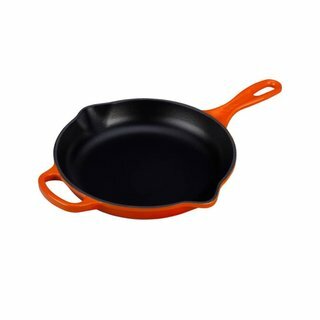 Easy-pour spouts—one on each side—are just one of the many chef-friendly features of this fan-favorite cast-iron skillet offered by Le Creuset. 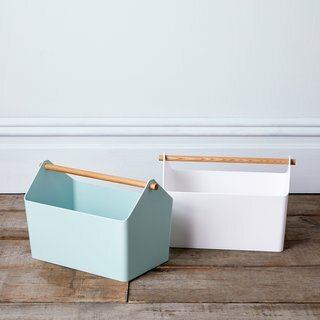 With its attractive minimalist aesthetic, this sleek catchall would make an ideal bath caddy filled with all your grooming tools. Situated underneath the loft, a cube comprising the refrigerator and pantry adds a dynamic, space-saving component to the kitchen. Selin + Selin’s projects largely flaunt sustainable missions, and Kim’s was no exception. Built almost entirely to passive house standards, it features photovoltaic solar panels, cellulose and polystyrene insulation, and a radiant hydronic in-floor heating system. 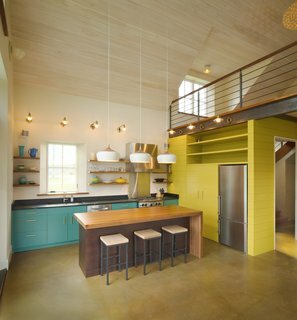 Locally milled barn board siding, a galvanized standing seam roof, and aluminum-clad triple-glazed windows that let in mesmerizing views of the outdoors pave the way to a light, understated interior outfitted with polished stained concrete and plaster enlivened by colors like aqua, chartreuse, and coral. Objects, from a skateboard to tableware to books, give the dining room a curated boutique hotel lobby feel. The spider chandelier is another highlight. Enhanced by views of the landscape, the flexible dining room table doubles as a workspace. 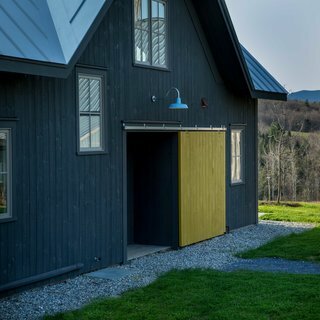 The farmhouse’s compact size naturally lends itself to warmth—and Selin + Selin amplified that welcoming aura by opting for materials in their raw states, like the railings crafted by a local metalworker. "They’re just metal, not painted to look fancy," he points out. "We didn’t want a dark, woodsy, camp feel." 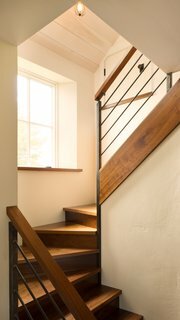 Thick slabs of walnut serve as treading on the staircase. Instead, it's airy, alluring nooks scattered throughout—including the dining room that easily morphs into a study, and the bedroom, reserved for visiting grandchildren, that is dressed with a porthole window. 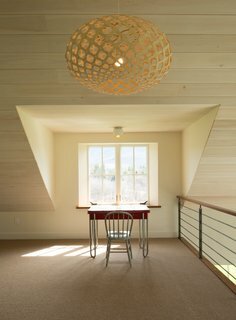 In the hushed upstairs loft, a pincushion-shaped chandelier with diamond-patterned cutouts appears to beautifully cleave the farmhouse into two symmetrical halves. The loft melds a walnut perimeter with soft carpeting underfoot. A retro desk provides a space for quiet time in the uncluttered loft. Locally sourced walnut abounds, and in the kitchen it takes the form of a centerpiece island accentuated by stained maple. Alongside one wall, the refrigerator and pantry are set underneath the loft area in a cube. They are "meant to be elements within the space, but they don’t define it. We didn’t want it to feel like it’s the limit of the room," explains Selin. "The cube is meant to be just another piece of furniture." 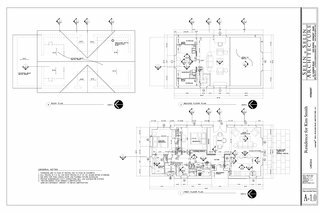 Selin + Selin Architecture's floor plan for the farmhouse.